Your ability to earn income is your most valuable asset. Disability insurance is designed to protect you from a possible loss of income. What’s the possibility of this happening? 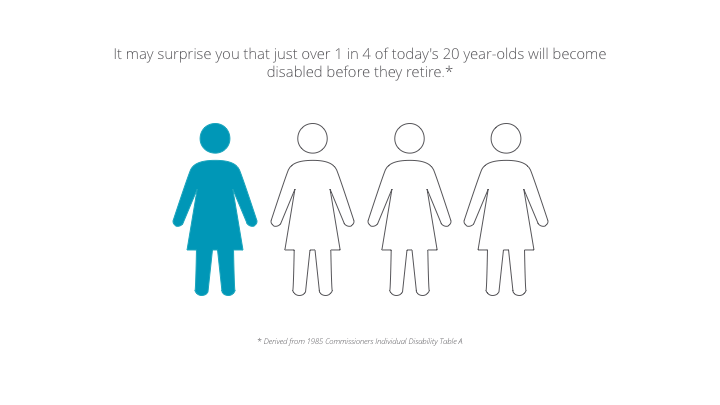 Below are some statistics on disabilities occurring at different life stages. Why should you consider personal disability insurance? Worker’s Compensation only covers work related accidents. Unemployment insurance only covers 15 weeks. Canada Pension Plan: Are you comfortable relying on the government for a benefit that can change? Group and association coverage can fill a valuable role in long-term disability protection. However, the benefit may be limited by the definition of disability and coverage amount. Remember, a custom designed individual disability plan will provide you with guaranteed coverage and guaranteed premiums. Do You Have Adequate Disability Insurance ? You have the right to renew your insurance for every year as stated in the policy. Also ifyou already have health problems, but are still working full-time, you can still get an injury-only” disability plan without any medical underwriting required. These “injury only” plans are very affordable because they do not cover any “sickness” related disabilites. If you can only work part-time, you can still receive a portion of your disability benefits. Watch out because you might have to be “totally disabled” first – before you ever qualify for “partial disability” benefits. Because this is contract language – please focus on the “definitions”, “limitations” and “exclusions” to qualify for a “valid” total disability claim. Policies with shorter waiting periods are very expensive, so you may want to choose a plan with benefits beginning 60-days or 90-days after a disability. The price difference will amaze you, so it’s also a good idea to set up an “emergency” line of credit to cover you until these longer-term benefits begin. Ask me to show you how to set up for both. Most employee “group” disability plans only pay you for two years, so try to find a policy that covers you longer or until you reach age 65 when you’ll be eligible for full goverment CPP benefits and other pension income. Many “group” disability plans will “offset” with income you receive from other sources, but better private plans do not reduce (offset) what they pay you each month – even when you receive income from other sources ! Some poor disability plans will pay you only when you can’t do “any duty” of “any job”. But with a much better OWN occupation provision, your policy will still provide income to you when you can’t do your OWN job ! Ask me about “Regular” Occupation Definitions. Would you like to receive a large Refund of your premiums paid when you remain healthy? This is similar to getting a safe drivers discount on your car insurance. You can qualify for a large premium refund, if you stay healthy and choose this option when you start your plan. Not all occupations will quality for a premium refund due to some industries having a poor claims history. Ask me if you qualify. The definitions, limitations, exclusions and other contract provisions determine the quality of coverage to be depended upon at the crucial time of your claim. Let me help. Sam has the knowledge and experience necessary to provide clients with effective tax-sheltered investment, insurance, and estate planning strategies designed to address the many long-term goals and objectives identified in the financial planning process. Mutual funds products are offered through Portfolio Strategies Corporation. Mutual funds and exempt market products are sold exclusively by Representatives who are licensed by provincial regulators and registered with Portfolio Strategies Corporation. Commissions, trailing commissions, management fees and other expenses may be associated with mutual fund/exempt market product investments. Please read the Fund Fact or prospectus carefully before investing. Mutual fund and exempt market product investments are not guaranteed, their values change frequently, and their past performance may not be repeated.